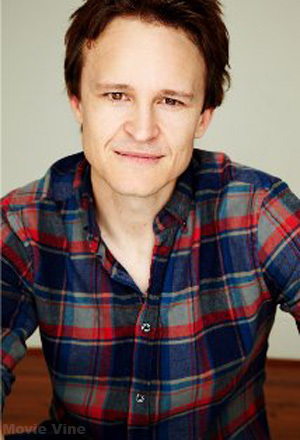 Damon Herriman is best known to American audiences as Dewey Crowe and Mr. Jones, but in his home country of Australia he has been bringing characters to life since he was a child. Growing up in front of the camera has given Damon the experience needed in becoming a successful director and writer as well. We caught up with Damon to discuss his summer films 100 Bloody Acres and The Lone Ranger. Damon also gives us some insight into sketch comedy, the history of Michael Howe, life on Vegas, and the whereabouts of everyone’s favorite Harlan criminal. MV: Welcome to Movie Vine, Damon. 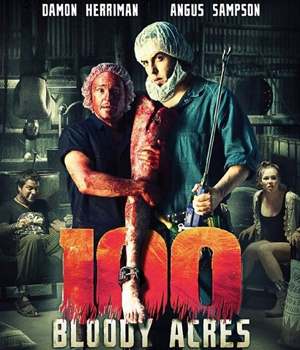 To begin, let’s talk about your character Reg in the upcoming horror film 100 Bloody Acres. I’ll let you explain his interesting job. Damon: Reg Morgan runs an organic fertilizer company with his brother, Lindsay. The big difference between their fertilizer and others, is that the latest batch is made from a very special ingredient – human remains. And it’s selling like hotcakes, because, well, it just works so much better. MV: This isn’t the first time you’ve portrayed a character who collects road kill (House of Wax). What is the most disgusting prop you have ever had to use? Damon: Probably the prop of a man’s severed leg in 100 Bloody Acres. It was incredibly realistic, not only to look at, but to touch as well. But some of that road kill in House of Wax was pretty gross too. MV: 100 Bloody Acres blends horror with humor. How fine of a line is there in bringing humor into a dark and demented story? Damon: I think it requires a very careful balance. And that’s what impressed me so much about this script. Col and Cam (Colin and Cameron Cairnes) wrote a brilliant screenplay and went on to pull off an awesome film. I think they injected just the right amount of comedy into the horror – or is it horror into the comedy? I think the comedy comes out of the right place. It’s never mean-spirited. MV: You’ve worked in both American and Australian horror films. Was there a noticeable difference between the tension and tone of the films even though they are based in the same genre? Damon: Well 100 Bloody Acres is very much a comedy horror. And while there was humor in House of Wax, you wouldn’t call it a comedy! 100 Bloody Acres is almost a comedy first and a horror film second. I think of it as ‘the Coen Brothers do Wolf Creek’. So yeah, the tone is quite different. There are definitely scares and squirmy moments in 100BA, but so many laughs too. MV: What was the last film that really scared you? Damon: I watched Paranormal Activity 3 at home with some friends recently. That scared the hell out of me! MV: You have a lot of awesome projects in the works. Michael Chiklis tweeted great photos of you on the Vegas set. We are excited that Mr. Jones is finally back. How much fun is it to play a man who even the bad guys are afraid of? Damon: I love it! I find it so funny. Here I am, this small-framed guy with glasses, and I’m in all these scenes with these massive tough guys who are acting afraid of me. It’s not something I tend to experience in real life, I tell you! MV: Who decided to create Mr. Jones with such a cold and calculated personality? Was this something that the writers had on the page, or a choice you made? Damon: Hmm… I guess it’s a combination of both. But mostly I’d have to give credit to the writers. The character seemed pretty clear to me on the page. And the more episodes we did, the more clear he became. Now we kind of work in sync, I think. They write for a character they’ve seen me do, and I’m playing a character who is becoming more and more detailed in the writing. MV: When becoming a character that is the polar opposite of yourself, is it easy to transition in and out between takes or do you have to keep yourself connected to the character’s demeanor? Damon: Usually I pop in and out. There are rare occasions – perhaps emotional or angry scenes – where I like to stay in my own head between takes. But usually I’m only the character between action and cut. MV: What can you tell us about your sketch show The Elegant Gentleman’s Guide to Knife Fighting? Is it scripted or strictly improv based off of a basic scene outline? Damon: It’s scripted. But, depending on the type of sketch, there can be a lot of improvisation that happens on the day. It’s a really cool show. It’s sketch comedy shot like drama. The performances are a little more low-key than you’d expect, but the sketches themselves are very absurd. I love that. MV: You play the title role in the upcoming The Outlaw Michael Howe. For those unaware of Michael’s story would you mind explaining a little about him and the basic history of his time? Damon: Michael Howe was Australia’s first ‘bushranger’ (outlaws and thieves who lived and hid in the Australian woods). At one point he was the most wanted man in the British Empire. He and his gang of men grew to such strength that they nearly took over all of Tasmania. It’s an incredible story, and even more incredible is that virtually no one in Australia knows about it. MV: In The Lone Ranger you play Ray who is also an outlaw. Do you have a preference between playing the good guy or bad guy? It would seem the bad guy would be a lot more fun to play. Damon: I think the bad guys are always fun. It’s funny, I spent the first half of my career playing mostly nerds and nice guys. Then after House of Wax when I started working in America, I got all these psycho roles. I guess no one here had any preconceptions about what I played, so it was kind of like a clean slate. Now I get bad guy roles back home too. I think I’m due for a nice guy gig again! MV: In back to back Westerns, I would assume you are now an accomplished rider. Did you have to go through specialized horse training before filming? Damon: Well, ‘accomplished’ is a stretch. The horse-riding teachers definitely wouldn’t think so! We did have three solid weeks of horse training on The Lone Ranger. And I definitely was a lot better by the end of that than when I started. But I haven’t done a lot since, so I’m not sure how I’ll go the next time I hop on a horse. MV: You have grown up acting on stage, TV, and film. Is there anything you’ve always wanted to be a part of but haven’t had the chance yet? For instance, a specific genre or a character type that might be outside of your comfort zone? Damon: There are so many roles I’d love to play – too many to mention really. But one that comes to mind is a mob boss. Something you’d see in a Goodfellas kind of film. I would really enjoy getting my teeth into that. MV: As an actor, writer, and director what do you find is the most difficult but rewarding challenge of filmmaking? Damon: The most difficult would be a) the pain of being bitterly disappointed when watching yourself back and b) the time constraints that limit the amount of takes etc you get to do. The rewards are the feeling of satisfaction when you see something back that you’re incredibly proud of. MV: You have mastered various accents from American to German. What is your process of learning the subtleties of a dialect? Damon: Australians have it a bit easier when it comes to accents I think, because we tend to hear a lot of them. Especially British and American. We get a lot of their movies and TV shows. So part of it is probably just from watching too much TV as a kid! With new accents, I listen to lots of stuff on the internet. And usually try to do some sessions with a dialect coach. I want to be able to get it to a point where I can at least not offend the people from that country. 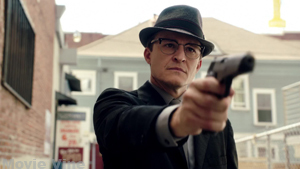 MV: Last question, what do you think Dewey Crowe (Justified) is doing right now? Damon: Sitting in jail counting the days till season 5! (apparently he’ll be back then). MV: Thank you so much for sharing with us today, Damon. We look forward to seeing Reg and his road kill in 100 Bloody Acres. *Follow 100 Bloody Acres on Twitter and Facebook. Be sure to catch Damon on Vegas (CBS Fridays), 100 Bloody Acres in June (US), and The Lone Ranger hits theaters July 3rd. 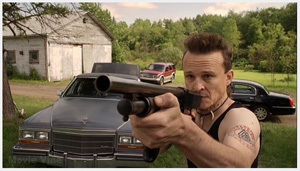 Comments for Between Takes with Damon Herriman are now closed.